Home > Lighting > Chandeliers > Chandelier, Spangles - Fuchsia - 8" x 18"
Spangles Fuschia Pink Circles Chandelier decoration - You loved our Spangles Circles Beaded Curtains, now we're bringing you matching hanging decorations! 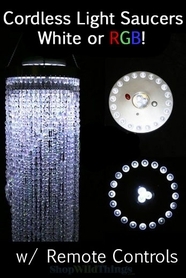 We call these "chandeliers" because you can add a light kit to them, but there is not a light kit included. The center of the chandelier already has the hardware needed to hold the Light Cord Kit in place. It looks super bright and metallic and fun without any added lights. Consider adding one of our LED Discs to sit on top. You might also like the matching Spangles Beaded Curtains that will really help tie your look together for both events and home decorations. This fun and hanging decoration features 2 concentric rings, 6" diameter inner ring with 18" long strands and 8" diameter outer ring with 11" long strands, 9" removable chain. PVC circles are 1.5" in diameter. Total length is 27" long. Available in 6 Colors. 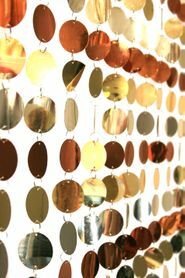 I love this Spangles Chandelier! In fact I just ordered 2 more for gifts of friends upcoming birthdays. Great company to deal with and great communication.